Whether as a means of inspiration, or a sense of some manner of purpose, it can be tempting to romanticize the lives of our forebears. Of this folly, I find women, in particular, are often guilty. We use romantic versions of nearly every lifestyle choice to bolster our spirits and convince us that we're doing the right thing, whether that thing is conquering a board room , raising a family or, perhaps most often, being a housewife. What's the harm, one might ask. On the surface, there is no harm at all. It's good to have rolemodels and hero(ine)s. Reaching for a time-honored ideal couldn't ever be bad, right? Wrong. It can be very bad. You see, the past has never been as glamorous as we might want to believe. There are a few eras which fall prey to the Romantic Flaw more than others, but amongst many homesteaders, Victorian times get the worst of it. It's not our fault, really. Unless we have researched extensively, all we know of the age is fed to us through upper middle-class tales of flowing petticoats, summering in the country, gathering eggs from a sunlit field, and receiving guests in our fire-warmed parlors. We envision hardwood kitchen islands covered in seasonal produce, freshly baked goods, and being surrounded by polite children studying embroidery, tending the gardens, and dutifully following their parents' command. In 1999, UK Channel 4 produced a mini-series reality experiment in an attempt to dispel at least of few of these myths. The 1900 House was the three-month chronicle of a typical British family sent to live exactly as they would've in the year 1900, at the tale end of Victoria's reign. The military family of six moved into a spotlessly recreated 1900s London townhouse and were forbidden from employing any modern knowledge or tools for the duration of the show. The husband wore a period uniform, shaved with a straight razor, and was charged with tending the fire in the family range. The children had to learn to occupy themselves with quiet hobbies and a lack of social life, as well as stodgy, utilitarian food which left the young son fully non-plussed. Then, there were the women. The mother of this tribe soon learned who got the rawest of deals during these post-Dickensian days. For the first month, she arose at dawn and began cooking the porridge, fielding door-knocking merchants offering their goods, ensuring the children were occupied, and beginning her daily cleaning which, in a coal-fired soot-filled home, was a non-stop effort. Laundry, boiled in baking soda water, took three days to fully complete. The state-of-the-art cooker often failed, meaning a roast might take 6 hours, and hot baths were but a mere dream. Family swimming fun was off-limits to her during her "curse" time, and life was a sour-making, grumpy chain of drudgery...until she pawned it off on someone of a lower class. Those halcyon days of yore were anything but—choked with pollution, poverty, and inequalities we've long since forgotten. There were moments, of course. Moments of perfectly genuine bliss, at least for those of middle class or higher. And I'm certain that those of even the poorest ranks learned to laugh past the hunger, maltreatment, arthritis, and illness. While taking lessons from this era can bring a needed knowledge to modern times, don't try to recreate the idealized vision of the past. You will falter and fail, and may even resent yourself for an inability to keep up with this romanticized version of days gone by. Instead, enjoy your modern freedoms. Savor the time gifted to you by washing machines, microwaves, and refrigerators. Thank the stars above that you may choose to live as basic or as complex as you wish, and that no man, woman, nor tome of proper household management can set you off your path. Live genuinely. Live uniquely. Live presently. It's all we've got. And give the 1900 House a few hours of your time. It's well worth it. I, like most of you, am often a mess of common, niggling ailments. Migraines that sour my mood, sniffles that sap my energy, muscle aches that make the couch all too appealing, and who doesn't get a bout of insomnia now and again? In my small family of pill-poppers, we spend twenty or more dollars each month on treatments for each of these issues. We have pain killers, sleeping pills, allergy tablets, everything. Frankly, I'm sick of sick...sicker still of pills and expense. So, to the dirt I go. I decided it was time to grow a medicine cabinet in my own back yard. Now, herbalism can be risky business. Certain bits, parts, and formulas can lead to all sorts of illnesses and even (scary music here) death. Upon deciding to embark on this herbal journey, I took up the books (well, okay, the net) and began researching. Given the choices, I decided to go with mostly herbs which have culinary uses as well as medicinal. The obvious reason is, if you can eat it in a soup, it probably won't kill you. A secondary reason was to save money on both the kitchen and pharmaceutical fronts. I've added a few other commonly used plants to the list and have come up with what I think will be a fairly handy variety of useful ingredients for infusions, tinctures, capsules, and poultices. Hang on tight. This is a long one! Aloe: The sap of this succulent topically treats nearly any skin irritation or injury. It can also be taken internally, but that carries more risk. Basil (sweet): Leaves, taken as an infusion or capsule, is good for digestive troubles and is also a mild relaxant. Calendula (Marigold): Petals of this common flower, infused in water, may relieve stomach cramps, fever, and flu symptoms. California Poppy: Root oil can be directly applied to achy teeth. A petal infusion is often used as a mild sleep aid and anti-anxiety tonic. Coriander (Cilantro): Infusions from the leaves and stems are soothing and may aid in digestion. Ground seeds can be formed into oatmeal-mixed poultices for achy joints. Dill: Leaves treat nausea and gas, and may aid in milk production for lactating mothers. Most often taken as an infusion, or as pure oil diluted in water. Echinacea: Common herb for treating general cold and flu symptoms. Also a noted anti inflammatory. It can be infused, but has a slightly foul smell, so is general preferred in capsules. Lavender: Very popular herb used for treating stress, anxiety, and insomnia when infused or used in a bath. The gentle oil can also be good for skin irritations. Marjoram: Leaves can be used to aid with depression and digestive stress when taken as a tincture or infusion. Poultices may relieve swelling on tender joints. Oil can be used to treat toothache, and inhaling the steam from an infused bath can aid respiratory conditions. Mints: Some people find the scent energizing, others find it relaxing. It is primarily used as a flavor softener for infusions of more pungent herbs, but can have some definite benefits for a queasy stomach, or as a skin bath, mouthwash, and the oils soothe tired muscles and joints. Spearmint is milder than Peppermint. Oregano: Related to Marjoram, it treats many of the same symptoms, though it appears to have greater affect on aches and fevers than the other herb. Used as an infusion, gargle, or bath. Parsley: An excellent general source of vitamins. A salad with only 1/2 cup of parsley contains over 50% of one's daily requirements of Vitamins A & C, and is also a good source of Folate and Iron. It packs a power-punching amount of Vitamin K, so be careful. It's also an excellent breath aid, a natural anti-inflammatory, and comes free on nearly every plate of food you eat at a restaurant. Rosemary: Taken through infusion or by just inhaling the steam, this herb can help with headaches and depression, and as a mild expectorant. Sage: Long used for spiritual practices, medical benefits can include treatment of mouth ulcers and sore throat, best used as a rinse or gargle. It can also be beneficial in compresses for cuts and scrapes. Thyme: My favorite culinary herb, it may be helpful in relieving depression, stomachache, and respiratory symptoms. In a tincture or rub, it can help with fungal infections. As soon as I can track down the seeds, there will also be Borage, Chamomile, Lemon Verbena or Lemon Balm, Feverfew, Skullcap, and Valerian. I'm really looking forward the sights, smells, and usefulness of all these wonderful plants. Even if they don't work at all, the process of studying, growing, and blending these herbs is therapeutic all on its own. We're moving. Wait, wait. No. We're not moving, yet. We are, however, in the process and mindset of preparing our little hovel for the market, and keeping a weather eye on house prices so we can find that precious little sweet spot that allows us an easy purchase while making buckets on our own sale. It's fun, really...Getting the house all primped like it's going on a first date. Unfortunately, it sets you into a mindflow of change. Impermanence is a concept which runs entirely contrary to most gardening philosophy. Think about it. We use words like "sustainable," "permaculture," and plant fruit trees which remain barren for two years, we build raised beds in which we intend to rotate crops over seasons to come, and so on. All of these imply a Homestead is in the bag. It assumes that we've found our niche, we've carved out our plot and are ready to dig deep and set down roots. So what happens when you're rootless? What happens is a hell of a lot of redesign to planned garden renovations and a scramble for as many plastic containers as one can find lying around the house. Containers are portable, after all. We've switched our mentality to that of temporary landlords and now must plan our garden efforts as such. So, today, yours truly rinsed, filled, sowed, and set out the following: 3 mixed leaf lettuce pots, 2 iceberg lettuce pots, 3 spinach pots, 4 punnets of broccoli and 2 of leek for later transplant, 2 trays of spring onion, 1 big pot of dwarf peas, and a single pot of cornflower seeds for visual appeal. Tomorrow, I'll add a couple of quick-harvest Brussels Sprouts and maybe another tidbit or two. Aside from the container gardening madness of the day, I seem to be holding steady on my US-Seasonal-Disorder theme. First, American tax day inspired me to rework our budget. Now, American Springtime has me on a cleaning frenzy. The punchline is, I'm in Australia. But, the result has been worth it. Food is planted, accounts are in order, and my kitchen is finally a warm a beautiful place I enjoy using. Yay for False Spring Fever! I wonder how long it will last. Perhaps it is my inborn American nature, inspired by the upcoming sacred holy time of Tax Day, but something about this time of year brings out my inner spreadsheet guru and has me thinking in terms of Compounded Interest and Adjusted Net Worth. One might think this would lead to a detailed description of how to scrimp, save, go frugal and add to your bottom line, but alas, I'm still figuring out such things, myself. What I will happily share is the only enjoyable chore I've had over the past week, in the few hours I've spent free of the Excel spreadsheets—cooking! In an effort to stay somewhat on theme, I present two cost-saving wonders. The first is a deliciously decadent seafood soup that costs a mere $8.40 AUD for the entire batch. That's enough to feed four, and it's even cheaper if you grow your own veggies and herbs. Substitution: I only used Mascarpone because I was out of cream. If you have cream, switch the milk & mascarpone for 1 cup cream. Chop vegetables into a large soup pot. Add in butter, oil (to prevent butter burning), herbs, and garlic. Stir in flour to coat all the veggies and sautee over medium-high heat until the aroma is strong, but the veggies should not brown. Slowly pour in the chicken stock and a simple splash of wine, allowing the heat to remain consistent. Simmer for 10-15 minutes. 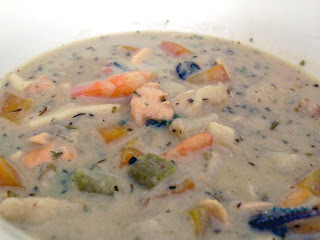 While the soup simmers, divide your seafood. Most "Marinara Mixes" (for Americans, this has nothing to do with red pasta sauce!) contain cooked clams or mussels, raw shrimp/prawns, chopped raw fish fillets like salmon and haddock, and cooked cuttlefish and/or squid. Divide out the fish fillets as these take a little longer to cook. Set shrimp, clams, and squid aside. Pour milk into the soup pot and slowly stir in Mascarpone, allowing all the ingredients to meld nicely. Return to a low simmer and drop in the fish fillet chunks. Cook for only a few minutes until the flesh begins to firm. Only then, stir in remaining seafood and heat until the shrimp is just pink. Overcooking will toughen clams and squid. Season lightly with salt & pepper, then serve hot with thick slices of your favorite bread. Idea: Next time, I'll be planning ahead and serving these San Francisco style, in fresh, warm sourdough bread bowls. Give it a try! You'll think you're sitting right on Fisherman's Wharf. Heat oven to 150 C (300 F). Pour some boiling water into a pie plate and set the plate on the lowest rack of the oven, with the highest rack being near middle. After 10 minutes, turn the oven off and let it rest. Warm the milk in a saucepan or microwave to a temperature which is warm to the touch, but not hot. Whisk in sugar until deserved. Gently mix in yeast and allow to sit for 10 or so minutes, or until a creamy foam appears on top. While the yeast is proofing, mix together flour, salt, and spices. In a small dish, soak dried fruit in warm tap water, until lightly plumped, then fold through the flour mixture. For choice of fruits, currants are common. I've used raisins, sultanas, and currants. Once your yeast has proofed, slowly stir in melted butter. Make a well in the center of your flour mixture, then add wet ingredients to dry and mix well. Let the dough rise for an hour, or until doubled in size. Punch the dough down gently, turn onto your floured work area and gently press into a rectangular shape. Cut dough into even squares, scissors work well, and tile across the bottom of a large, lightly oiled, baking pan. Re-cover and rise in the warm oven for another 30-45 minutes, or until again doubled in size. In a small dish, blend together 1/4 cup flour and 1/4 cup confectioner's sugar with a bit of water. The goal is a medium-thick paste. Spoon into a plastic zipper bag. Snip off one bottom corner of the bag and use as a piping tool. Remove the risen buns from the oven and uncover. Pipe cross-like lines over the buns while you pre-heat the oven to 200 C / 390 F.
Put the buns in the oven (no puns!) and bake for 20-25 minutes until the whole house smells delicious and the buns are nicely browned. In the small dish you used before, melt 1 tbsp butter and stir in 2 tbsps honey. Take the buns from the oven and then brush lightly in the honey-butter glaze. Allow to cool a bit in the pan. Best served warm or re-heated, and eat them fast! These go stale within a couple short days, but freeze well for up to one week. Alternative idea: Try subbing fresh or dried apple and finely chopped walnuts for the currant mix and glaze with butter and maple syrup. A yummy Autumn treat for those Down Under, celebrating Easter in the Fall. To make French Toast: Simple as can be. Whisk up two eggs, a splash of milk, and a touch of vanilla. Cut stale hot cross buns in half, width-wise and soak in the egg bath until spongy, but still intact. Melt some butter in a large pan and fry the soaked buns, cross-side up, until golden brown. Flip, fry some more, then serve with butter and maple syrup, sprinkled confectioner's sugar (icing sugar), honey, or fruit. No season brings out my inner chef like Fall. While my warmer weather dishes drift toward the gourmet, something in the crisp chill of the autumn air, the frequency of grey, rainy days and long, clear nights inspires a deep craving for filling, richly colored dishes that no other season can bear. Two recent autumnal meals, in particular, have scratched this culinary itch. Preheat oven to 220 C (430 F). Pre-chop all the veggies, slicing pumpkin (or winter squash), carrots, and red pepper (capsicum) julienne for quick roasting. Toss together pumpkin, onions, peppers, carrots, broccoli, 1 tbsp olive oil, herbs, and garlic and roast for 20 minutes, stirring after 10. In a large pot, boil water and prepare 1/3 packet of spaghetti, broken in half. Reserve 1/4 cup of the pasta water, drain the rest and set aside. In the pasta pot, lightly sautee tomatoes (I used a late-season mix of heirloom green and ripe) using the remaining olive oil. Add in drained spaghetti and stir well. Finally, stir in roasted veggies and toss with grated parmesan cheese. Add salt and pepper, to taste. Serve hot with an extra sprinkle of cheese. This is a full meal for 2-3 people. In a large mixing bowl, stir together melted butter, olive oil, and lemon juice. Toss chopped vegetables, fruit, and walnuts in the mixture until well coated. Sprinkle in brown sugar, cinnamon, ginger, and thyme then toss again to spread the flavorings around. Spread a single layer of the mixture into a large roasting pan. Roast for one hour, no stirring necessary. Grind a bit of sea salt cross the roasted veggies once they're finished cooking, and serve. This dish is a hearty side for 2-3, or a small accompaniment for 4-6. For a delicious Western European meal, serve this with traditionally prepared Corned Beef and some steamed and salted Brussels Sprouts. My recipe for Corned Beef is simple. Just simmer the meat with bay leaves, a sprinkling of brown sugar, at least a tablespoon of apple cider vinegar, and half an onion, chopped. Simmer about two hours for an average sized cut of corned beef brisket. A standard 2 lb/1 kg roast makes dinner-for-two and a week's worth of lunch meat.